Discussion in 'Clothing & Gadgets' started by Murdo, Nov 3, 2018. 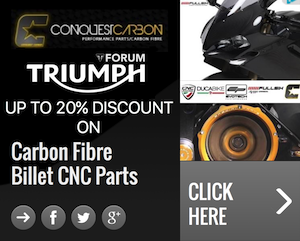 Haven't seen any mention here so here's a heads up - Triumph are selling off many accessories at 50% discount on their web page. Harrumph. They never have anything, let alone anything useful, for my Tiger Sport. Thanks for the heads up bro. There are some really good prices! Now if only they had some LED indicators too. I've noticed on the list, a tank bag front mount. I have a speed triple tank bag, doesn't it come with one, or do I have to buy one separate? Take the number and put it into google one of the triumph sellers will/ should show you a picture, then you can check if you have this part or need it, cant help more not familiar with your model. Yeah, I'll check when I get home from work. Just thought someone on here might know. Thanks. How do you order parts from the sale? I click the link. Go to the sub heading for my bike. Find the list of discounted parts. Then what? There appears to be no way of buying them online? 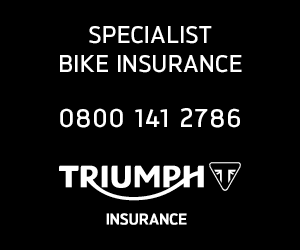 Do you have to get your local Triumph dealer to order them in? I copied the parts number and ordered from World Of Triumph. Cheers mate but I had tried that. It comes up at the full price? I fancy giving the Bonneville gel seat a go. At just over £50 I figure it's worth a punt? Even though I've heard they aren't much better than the standard vinyl covered dry stone wall? That is weird. Worth giving them a call though. I'm looking at the gel seat as well, for the same reasons DD. If you have any success ordering one at the sale price will you let me know? As I said. The reports I've heard make them sound only slightly better than the standard seat? So there's no chance I'd buy one at the full price! However, at a little over £50. I'd give one a whirl. I'm glad to hear you've been blinging up my next bike & on the cheap! I hope it's safely tucked away in the garage for winter. After a meticulous clean/wax? ACF 50 where needed, Covered up now all tucked in but should the sun shine then I would still bring her out for a blast. While she was up on lift checked front and rear brake pads, as easier to do on the rear when lifted all is good for now. You didn't mention that she comes with a bike lift & a full set of cleaning products? AND a made to measure cover! Is that so your neighbours don't see that you're a closet Chromeosexual. When the garage door is open?